What a technician needs to know about electric coolant pumps and water circulation pump functions and diagnosis. As we all know, this pump type consumes “constant” rotational energy that is produced by the engine because it is driven at all times when the engine is “running” – even when cold started. This method of driving the coolant pump, dramatically increases fuel consumption and emission levels. When the mechanical pump speed doubles, the power it consumes increases by eight times. Question asked: why is the trend towards replacing the traditional belt driven mechanical coolant pump on current vehicles with electric types? 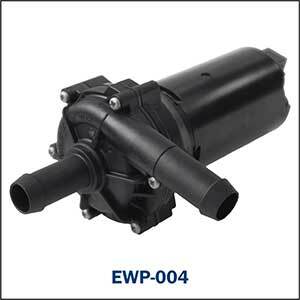 By removing the parasitic power losses of belt driven coolant pumps, the EWP can create a saving of up to 10kw of power. This generally provides a fuel saving that is estimated to be from 3.5% up to 10%. Also, lower emissions created by reduced losses and from faster engine warm up. The PCM controls the operation/required coolant circulation which allows for far better engine temperature control. The PWM control allows for variable pump speed and coolant circulation at any engine RPM. Internal cabin heater efficiency would be reduced on start/stop systems when the engine is not rotating if a mechanical coolant pump only was fitted in cold climates. No coolant flow would create accelerated heat dissipation from the coolant in the heater core area resulting in reduced heater air flow temperature. 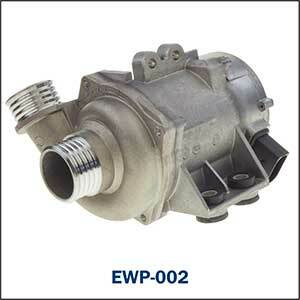 An EWP can circulate coolant when the engine is not turning and allow for better internal cabin climate control. Note: An auxiliary water pump connected to the cooling system on vehicles fitted with belt driven mechanical pumps can be utilised for the circulation of coolant through various systems for temperature control purposes. This application does not reduce engine power losses but will improve systems temperature control. These pumps have been utilised in Diesel vehicles for a while but now are commonly fitted on many petrol and hybrid vehicles with more and more manufacturers turning to multiple electric water pumps for greater temperature control. Battery pack temperature control on hybrid and stop /start systems. Heater temperature control when engine is not rotating. Auxiliary pump modes of operation. The auxiliary pump (like the electric coolant pump) does not continuously operate. The PCM or controlling module requires specific input data for pump control. Note: Mercedes stationary ventilation system - Remote activation of the heating and ventilation systems makes pre-entry climate control of a parked vehicle possible. The heating or ventilation are activated depending on the exterior temperature and the target value set on the A/C control panel. If the vehicle is equipped with Mercedes Stationary ventilation system, which operates after the driver has left the vehicle, there are additional parameters required to activate the pump. A suitable scan tool can test the pump function in most vehicles. It may also be possible on some vehicles to test the system by pressing a HVAC vehicle specific control head button sequence as required by manufacturer. Typical Causes of pump failure. Electric motor brushes wearing is a common cause as is with most electric motors. Overheating can cause premature failure due to coolant being forced passed the shaft seals. Low coolant levels may also prematurely damage the electric coolant pumps. Incorrect coolant inhibitor mixtures may also cause internal damage to pump and engine coolant chamber surfaces. Connector terminals condition at harness and/or pump. An auxiliary water pump generally will not cause engine overheating but will cause specific system temperature inconsistencies. A failing coolant pump utilised for engine cooling purposes generally will cause engine temperature inconsistencies. Any fault codes logged requires close attention as many unrelated codes such as collision detection, door module operation and loss of communication incidents may cause deactivation of the pump. The Premier Auto Trade Sensor range includes 7 Electric Water Pumps (EWP), covering over 130,000 vehicle applications in Australia and NZ.